Note the somewhat fimbriate calyx and the modestly bilabiate corolla, illustrating C. moorei‘s likely origin as a hybrid between a species from section Columnea and C. minor (or a close relative). Regardless of which animal, bird or insect mechanisms may be involved in pollinating species of Columnea, it appears that most species that have been examined are capable of self-pollinating to produce fruit and viable seeds, at least in cultivation. Selfing is common in many plants and occurs when the pollen from the same flower, or other flowers on the same individual are capable of fertilizing the eggs of the same flower or same individual. This can be advantageous in areas where plants may occur at low frequencies, often the case with epiphytes and many species of Columnea. However, most species of Columnea that I have observed in cultivation also have a means to optimize fertilization with another individual. Although flowers contain both stamens and carpels, the stamens are typically fertile first, often for 1-3 days before the carpels are fertile. After this time the filaments of the stamens coil up, pulling the pollen-producing anthers back into the flower and away from the stigma that becomes fertile later. In addition to being capable of self-pollinating, many species of Columnea are capable of fertilizing other species, thus forming interspecific hybrids. Although this phenomenon may not occur frequently in the wild, there has been at least one well-documented case in Jamaica and probably others in South America. Early in 2017 I published a paper with John L. Clark, Oscar H, Marín-Gómez, and Marisol Amaya-Márquez that demonstrated that a group of species with large anisophyllous leaves characteristic of section Collandra are from an ancestral hybrid between a species of section Collandra and a species from the C. pulchra clade (the exact species was not determined). The same paper also showed that the rarely collected Panamanian species C. moorei is also a hybrid, likely between a species from section Columnea and either C. minor or a close relative. C. strigosa exhibits characteristics of bat pollination, including the color of the flowers and especially the long pedicels. However, bats have not been observed actually feeding at the flowers. 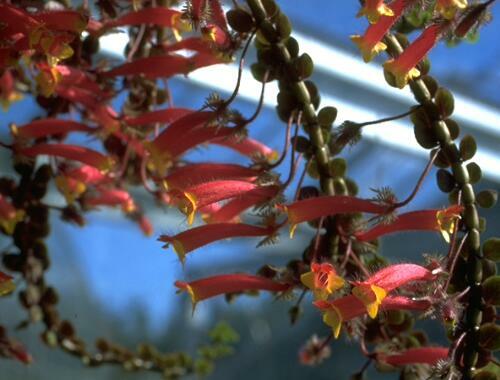 However, anyone who has been able to grow two species of Columnea that flower at the same time can generate hybrids by exchanging the pollen between the flowers and raising the seedlings that come from the fruits. Columnea strigosa is unusual among species of Columnea for having a larger than average corolla opening and often long pedicels that can be 30 cm long. As such, it has been speculated that the pollinator of this species may be a species of bat rather than hummingbird. The orange corollas and long pedicels are not outside the range of bat pollination syndromes; however, most bat-pollinated species have strong musty odors, which C. strigosa lacks. 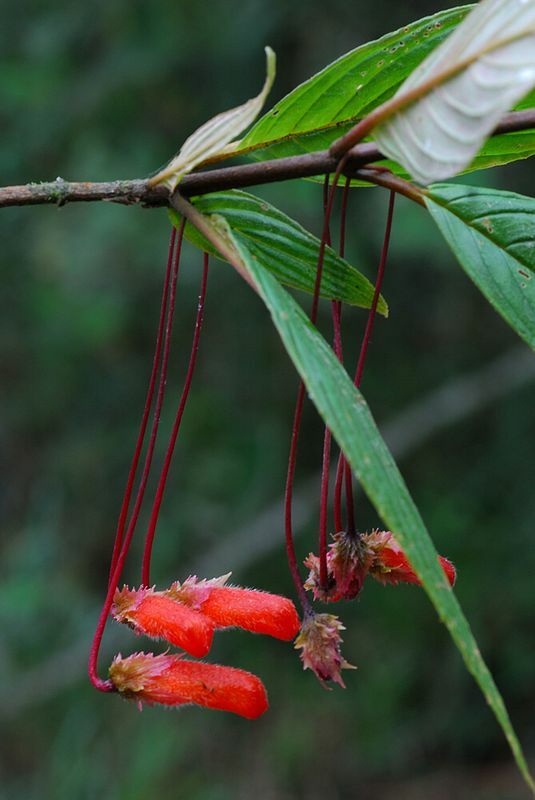 Ben Weinstein has multiple observations of Columnea strigosa flowers in Ecuador and has never documented visitation by bats, but has seen hummingbirds visit the flowers and often “rob” the nectar by taking it from a hole at the base of the corolla where the nectar is produced, rather than entering the flower from the opening and doing their jobs as pollinators. The actual pollinator may still not have been observed.